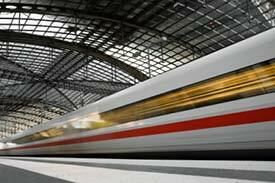 ABOVE: An ICE train speeds out of a Deutsche Bahn station. The DB's international pages provide an interactive timetable and other resources for English-speaking travelers. This article is packed with information on the history of ICE trains, the route network, equipment, maintenance, international services, and more. Drill down through the many ICE subdirectories for trainspotter photos of Intercity-Express trains in Germany and neighboring countries. The German National Tourist Board has general information and localized sites for visitors from many different countries, including a U.S. tourism site at www.cometogermany.com. This informative site covers 14 small- to medium-sized Germany cities of unusual charm and architectural interest. Photo copyright © Olaf Loose.